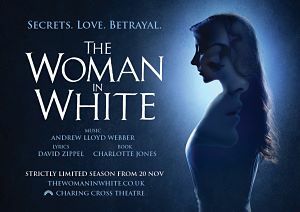 Thom Southerland (Titanic, Grey Gardens, Grand Hotel) is to direct the first ever revival of Andrew Lloyd Webber’s Tony and Olivier Award-nominated musical The Woman in White at London's Charing Cross Theatre for a strictly limited 12-week season from 20th November-10th February 2018. Principal casting news so far is that Chris Peluso (Showboat, Miss Saigon, Funny Girl) is to play sinister Sir Percival Glyde with Anna O'Byrne (The Phantom of the Opera) as Laura Fairlie with Carolyn Maitland (Ghost) as Marian Halcombe, Ashley Stillburn (The Phantom of the Opera) as Walter Hartright, Greg Castiglioni (Titanic) as Count Fosco, and Sophie Reeves (Les Miserables) as Anne Catherick. Australian musical theatre star, Anna O’Byrne/Laura Fairlie played Christine in the hugely successful Australian premiere of Love Never Dies, which was later filmed for DVD release. Andrew Lloyd Webber then brought Anna to London to make her West End debut in The Phantom of the Opera. She won the 2017 Helpmann Award for Best Actress - the Australian equivalent of the Olivier Awards – Anna received the award for her performance as Eliza Doolittle in the sold-out 60th anniversary production of My Fair Lady at Sydney Opera House. The show was cast and directed by Dame Julie Andrews. Chris Peluso /Sir Percival Glyde. Chris starred as Death in the European premiere of Death Takes a Holiday and played Nicky Arnstein opposite Sheridan Smith in the UK tour of Funny Girl. He made his West End debut as Chris in Miss Saigon and was Missisippi gambler Gaylord Ravenal in Show Boat at the New London Theatre. Carolyn Maitland/Marian Halcombe starred as Molly Jensen in Ghost, Sally Bowles in Cabaret, and Ellen in Miss Saigon. Ashley Stillburn/Walter Hartright was previously in Death Takes a Holiday at Charing Cross Theatre and has previously played Raoul in The Phantom of the Opera. Greg Castiglioni/Count Fosco credits include the European premiere of Titanic, Fiddler on the Roof at Chichester, Evita (Magaldi), The Phantom of the Opera, Cats and Lend Me a Tenor. Sophie Reeves/ Anne Catherick is a recent graduate of Guildford School of Acting, and has appeared in the West End company of Les Misérables.